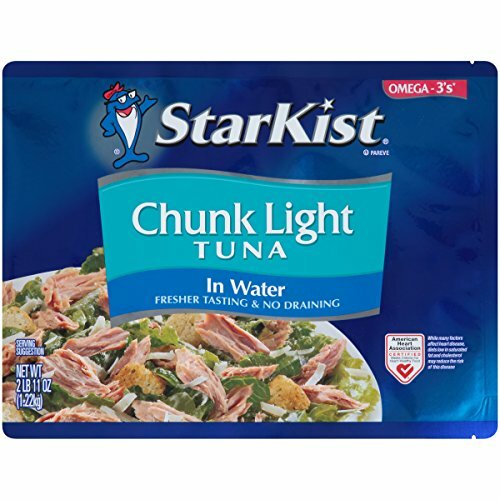 The Low Sodium Chunk Light Tuna in Water 43 Ounce Pouch has select cuts of tuna hand packed in our Star-Kist Flavor Fresh Pouch with only 110 mg of sodium per 2 oz. serving. Because no draining is required, it’s perfect on a salad, in a sandwich, right out of the pouch or used as a substitute for beef or chicken in your favorite recipes. Our tuna is wild caught and dolphin safe, meaning it is a non-GMO food. We are also 100% committed to Dolphin Safe fishing methods. Select cuts of tuna hand packed in our Star-Kist Flavor Fresh Pouch with only 110 mg of sodium per 2 oz. serving. Because no draining is required, it's perfect on a salad, in a sandwich, right out of the pouch or used as a substitute for beef or chicken in your favorite recipes. If you have any questions about this product by StarKist, contact us by completing and submitting the form below. If you are looking for a specif part number, please include it with your message.